April 9, 2017 0 comments on "In review"
Ekphrasis. It’s one of those arcane poetry terms that sounds foreboding, like onomatopoeia, caesura, and the catalectic line–terms that could double as medical disorders or the pharmaceuticals meant to treat them. Ekphrasis is a simple concept, once you get past the cryptic name. It comes from two Greek words: “ek” for “out” and “φράσις” for “speak”. It literally means to speak out vividly on a subject (person, place, thing, or experience), and for the Greeks it was a sort of rhetorical exercise in description. The ekphrastic poem in our day has acquired a more focused meaning: a poetic description of a work of art, not so much literal description as a poem inspired by the artwork. The best ekphrastic poems engage in an interactive and stimulating dance with the object. They emphasize, not merely the look but the object’s essence, or, they can focus on what the object inspires inside the writer. One thinks of Rilke’s “Archaic Torso of Apollo,” for instance. The poem’s aim is not really trying to describe faithfully the look of the headless, armless, legless statue (although it does describe it in an evocative way). Rilke is more interested in personifying it, investing it with visionary power and illuminating its impact on the observer: “there is no part that does not see you / you must change your life.” Often a good ekphrastic poem does a double service for the reader. It sheds light on the artwork in a new way (the poet acting as creative visionary) and it touches, knocks, and opens up new semantic possibilities that were only tangential to the art, if they were ever there at all. It’s a bit like jazz improvisation. You take an old standard, unpack its chord chart and riff on it, creating something new and unforeseen in the original. zinnia when I see one. That’s not a small thing! It’s not until halfway through the poem that Redon makes an appearance, his work offering an associative analogue and validation of the poem’s sentiment. 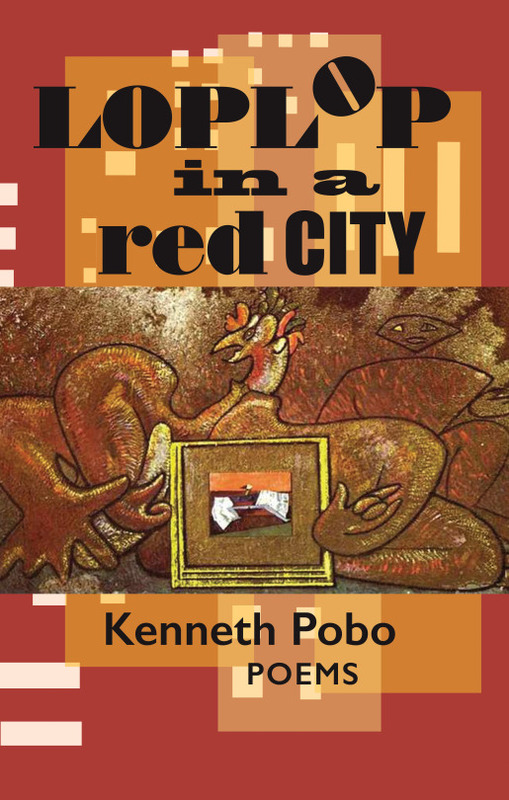 Many of the poems are about Pobo finding a pathway into the painting in order to identify with the painter’s vision. He sees himself in its figures then hauls the painting’s subject matter into his personal world. Some are more anchored in the subject, as in “The Third of May” after the painting by Goya, which empathically enters into the subject position of the condemned man standing before the firing squad. Others are cast in the mold of surrealist romps that blend identification with dream image and intuition. The poems are capable of revelry and revelation, and moving from poem to poem, you never know what you’re going to get next. It’s a playful, upredictable course, and like modernism, the going is not always easy or obvious. But it is in the jump cuts and curious juxtapositions where the work gets most interesting. My favorites here, it’s probably no surprise, are the poems where I am familiar with the artwork he’s writing about, and it’s fascinating to witness how this poet sees and is impacted by those works. 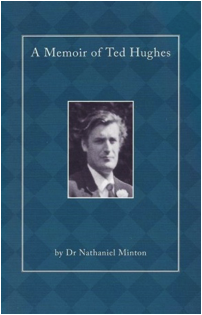 November 1, 2015 0 comments on "A Memoir of Ted Hughes"
Dr. Nathaniel Minton provides a glimpse of the poet Ted Hughes’ inner circle (Hughes called them “the gang”) from his Cambridge days. Dr. Minton knew both Hughes and Sylvia Plath throughout their creative and personal lives, and he writes with an informal intimacy of style sometimes lacking in other memoirs about Hughes. Minton also shares abiding memories of Hughes and the women in his life at the time: wife Sylvia Plath, and lovers Assia Wevill and Susan Alliston. He shares his perspective on the fateful night at the St. Botolph’s Review launch party, when two oceans converged (Hughes and Plath), but cannot recall whether he actually witnessed their meeting. Plath notably did not like Minton and treated him disrespectfully when he saw her last. She wrote ill of him in her journals in unkindly terms. Whilst confessing that he lacked the literary background of others in Hughes’ circle, Dr. Minton admits that he harboured a liking for Gerard Manley Hopkins and knew some lines of Shakespeare and Blake. He touchingly recalls how an Irish Muse flitted away across the Irish sea, leaving him with an enduring love for Irish culture, its mythology and the poetry of W. B. Yeats. With Hughes he shared an interest in the Jewish Kaballah and suggests that it was Assia Wevill who drew him to it, though he would already have been familiar with Jewish mysticism and folklore before her appearance in his life. Minton argues that Wevill was, in fact, psychologically disturbed and tormented by Plath’s death (a few years later she too would commit suicide as Plath had done), and as has been reported elsewhere, she seemed to be haunted by Plath’s ghost. He points out that Hughes’ work in art therapy has gone largely neglected and proposes that it be seriously studied among psychiatrists and psychotherapists. This memoir was one of the books proposed as part of a commemorative volume in celebration of the tenth anniversary of Hughes’ death. The project never came to fruition, however, due to disputes over copyright, but individual memoirs by Hughes’ close friends such as this one, are well worth a read. Rehan Qayoom is a poet, editor and translator educated at Birkbeck College, University of London. He has featured in numerous literary publications and performed his work internationally. He has published 2 books of poetry. January 17, 2015 0 comments on "Animal Farm by George Orwell"
When I recently came across Animal Farm in my local bookstore, aside from thinking it had a pretty cool cover design, I was immediately brought right back to high school. For certain English classes, the book was required reading. Unfortunately for me, it was never one of my required books, so as I listened to my peers’ opinions and discussions revolving around the novel, I was never able to take part. Everyone seemed to be utterly divided. Some claimed it was a work of pure brilliance, others were convinced it was the single most boring and irrelevant novel they had ever been forced to read. Now, several years later with a fresh opportunity to discover George Orwell’s short, but incredibly powerful novel, I eagerly took a seat and opened the front cover. It didn’t take long for me to discover what all of the excitement was about. Besides being beautifully written, Animal Farm possesses themes and ideals which are still relevant to today’s society. With the use of allegory (the idea that there can be found a hidden moral or political meaning behind the apparent “fairy story” as Orwell calls it) Animal Farm instantly resonated with me. Having been written in the dawn of World War II and published during the rise of Soviet Russia, the novel reflects ideals of totalitarianism and revolution. Without giving too much away (because if you haven’t read it yet, you certainly should! ), Animal Farm follows the journey the farm animals embark on to become independent of their human master and to become self-sufficient. The animals face very human problems, which only helps the reader to empathize with them all the more. The personification of the farm animals is brilliantly mastered, and as the plot progresses, certain events take place which are later skewed and distorted to benefit certain characters. The farm animals, being entirely too trusting in the word of their chosen leader Napoleon, are willing to believe anything he says out of fear of going back to how their lives had been before their revolution. It soon becomes all too clear that Animal Farm reflects society and our all-too-willingness to believe what is shared with us from the media and government. Although Animal Farm appeared to focus solely on politics when it was written, in this modern era – where the internet seems to dominate our lives–the novel can be reflective of the distorted and extremely filtered information shared with us through media. The twisting of truth and actuality by Napoleon reminded me of instances in which it was abundantly clear how the media distorted stories for their benefit (e.g: Same Story Different Crew). In this modern era, we hardly ever read or hear a story objectively, but rather are always subjected to viewing it in the light that the media deems fit. By doing this, we’re sort of forced to view things the way the media shows it or allows us to see it. We’re unable to form our own unbiased opinions because by the time information reaches us, it’s already been distorted and filtered. Aside from reflecting the media’s gripping hold on society, the allegory seems to make it all too clear how utterly inequitable society is in its entirety. In many instances, the rules given to the animals in Animal Farm designed to make sure that they would never become like their greatest opponent—man—soon become twisted and changed to allow some animals to be more equal than others. If that’s not reflective of our society, then I simply don’t know what is. Although the subject matter is heavy, it’s presented in a very light way that makes the pages easy to turn, and the last sentence will leave you utterly speechless (at least it did so for me). Anyone can take something away from this book, no matter how young or old they are. That being said, the themes hold much more weight for those acquainted with the idea of totalitarianism, especially Stalinist Russia (warning: spoilers!). On the surface, Animal Farm can be interpreted as a fairytale, it’s true, but a deeper meaning becomes apparent when we slip out of our human shoes, find ourselves easily relating to the very well-developed characters, and suddenly realize that we have much more in common with farm animals than we ever would have thought possible. 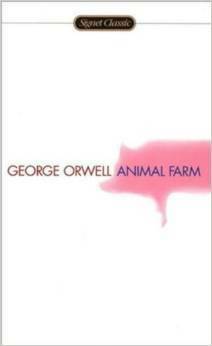 For a more in-depth review and explanation of Orwell’s work, I found Cunningham’s Getting to “No”: Snowball’s Chance, Animal Farm, and “Exemplary Truth” incredibly insightful and certainly worth looking over. I’ll warn you though, if you haven’t yet read the book, it does contain spoilers.